Foodies and gourmets, rejoice, and get ready to satisfy your epi-curious itch on Ecruising’s ultimate gastronomic odyssey – The Culinary Dream through AsiaRail and Sail journey. Departing on 27 February 2019, this mouth-watering 24-night itinerary takes in some of southeast Asia’s most celebrated food destinations as well as a 2-night train trip aboard the iconic Eastern & Oriental Express, hosted by celebrity chef, Luke Mangan, and a 15-night cruise from Myanmar to Indonesia. Your journey begins in Singapore where you will have 2 nights to explore the city’s famous Hawker stalls at your leisure, before boarding the Eastern & Oriental Express. Over the next 3 days, join Luke for a series of tours and cooking demonstrations as he shares his passion for Asian cuisine, and immerse yourself in the tranquil scenery of rural Malaysia and Thailand, before arriving in Bangkok on 3 March 2019. Highlights en route include stopovers in the royal town of Kuala Kangsar in Malaysia’s Perak Province, visits to Thailand’s notorious River Kwai Bridge and the Thai-Burma Railway Museum, a bicycle tour through Thai rice paddies and cooking classes. 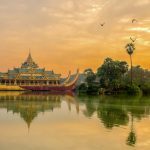 From Bangkok, you’ll fly to Yangon in Myanmar where you spend one night before boarding Silver Discoverer on 5 March 2019 for an exciting 15-night Silversea Expedition – taking in India’s Andaman and Nicobar Islands and a semi-circumnavigation of Sumatra and Java. One of India’s most remote territories, the Andaman and Nicobar Islands are slowly opening up to tourism and the cruise offers an unparalleled opportunity to learn more about the Islands’ indigenous tribal communities. Relax and explore some spectacular beaches or, if you are feeling more energetic, snorkel with an astonishing array of sea creatures including snappers, Napoleon wrasses, moray eels, nudibranchs, eagle rays, stingrays, star fish, lionfish, and many more. Entering Indonesian waters, cruise highlights include a stopover in Banda Aceh on Sumatra’s tip, with its solemn monuments commemorating the 2004 Boxing Day Tsunami; an immersion into the traditional farming and fishing lifestyle of Indonesia’s picturesque Simeulue Islands; astonishing demonstrations of agility from the Nias Islands’ famous stone jumpers; and a visit to a traditional matrilineal Minangkabau village in West Sumatra’s lush highlands. Also on the itinerary are visits to Java’s UNESCO World Heritage site of Ujung Kulon National Park; the awe-inspiring volcano of Anak Krakatoa rising dramatically from the Sunda Strait; the stunning Karimunjawa Marine National Park with its 27 islands surrounded by dazzling corals; the Great Mosque of Sumenep built in 1763; and the active volcanos of Mount Semeru and Mount Bromo in Bromo Tengger Semeru National Park. Disembarking in Bali on 20 Mach 2019, spend the final 3 nights of your journey discovering the unique and exotic flavours of Balinese cuisine. Visit the famous Gianyar Night Market, indulge in a traditional Megibung dining experience and try your hand at making local dishes at a Balinese cooking class, before flying home to Australia on 23 March 2019. Departing on 27 February 2020, prices for Ecruising’s 24-night The Culinary Dream through Asia Rail and Sail journey start from $15,359 per person twin share, including all accommodation, return economy class airfares from Australia, transfers, and all meals and selected beverages aboard the Eastern & Oriental Expressand on board Silver Discoverer.